Waiting for a Sign marks the return of Githead after a five-year break from recording. Although Colin Newman, Malka Spigel, Max Franken, and Robin Rimbaud have been pursuing their own successful creative ventures during their extended sabbatical, the lure of unfinished Git-business has eventually proven too hard to resist. Fans will recognize many of the classic Githead tropes here: present and correct are the hypnotic, motorik repetition, the weighty bass lines, and the dreamy melodicism that have come to define the bands aesthetic. But Waiting for a Sign isn't about sticking with a proven formula: Githead are forward-looking musicians, committed to reinvention rather than recycling. Indeed, this album attests to considerable sonic evolution and transformation, staking out a diverse range of new territory for the band. That's not to say that Githead embark on projects with rigid plans, in pursuit of a preconceived sound or specific song structures. Over time, the band's creative processes have become less driven by conscious decisions and fixed ideas and more focused on the organic development that comes from live in-studio playing during the recording itself. "How the material turned out is at least in part because there was no plan as regards the actual music. The time in the studio was simply the frame; there was no discussion at all as to what kind of thing we'd be playing." 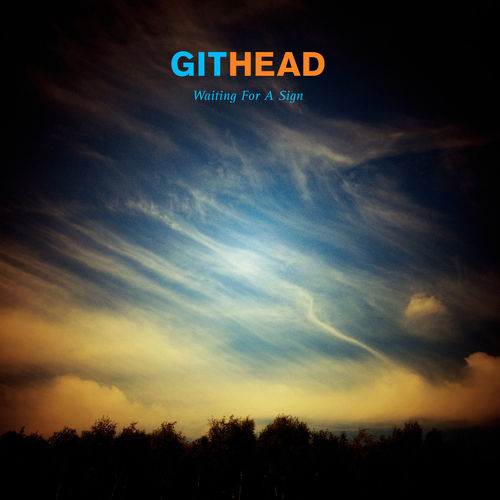 Githead communed, coaxing out unusual and arresting sounds. Waiting for a Sign feels, in essence, like musicians playing in a room together. It's a simple process, according to Spigel: "One person starts, and we all fall into it. Max and I used to play in Minimal Compact together, so sometimes we'd just start something as a rhythm section. That's how Githead works - we're used to just falling in with each other. We're so easy together that sometimes I don't remember how things started. We just do it." Newman was determined to preserve this characteristic of the sessions when he took the foundational Rockfield material back to Swim Studios in London and embarked on the second stage of recording and production. "We tried to keep in as many of the idiosyncrasies of the original performances as possible: false starts, played fades, dynamic drops and builds." To that end, his production on tracks like "To Somewhere" and "Not Coming Down" retains a strong sense of the musicians' contributions gradually knitting together into absorbing textures. These are what Newman jokingly calls "instrumentals with singing" - indicating how the songs came almost after the fact of the initial studio improvisation: "'To Somewhere' was basically a groove you couldn't argue with," he says. "We developed the 'song' aspects back at Swim Studio led by the chords, but it never felt appropriate to have a traditional verse/chorus structure." It's important to recognize this second phase of work. "What we produced at Rockfield was quite rough," Spigel emphasizes. "It was literally just starts or very rough bits, and then we worked a lot on it afterwards. Colin gave it a shape, making songs." Some of the transformations at Swim surprised even Spigel: "It was hard to see how 'Not Coming Down' was going to be a song, but it ended up as one of my favourites. Tracks that sounded completely rubbish at Rockfield became something else, and we brought something really amazing out of them. Sometimes it was only the end bit that was good, or just the beginning, but we can create something out of almost anything if we take it home and fiddle with it." By the same token, Newman adds: "There were some pieces that sounded fantastic at Rockfield, but when we started working on them, they sounded a bit rubbish!" Just as the seamless alchemy of the band members' ensemble playing is preserved, other sonic features accentuate the album's liveness in a very different fashion, with instances where songs proceed far less smoothly. "Air Dancing," for example, comes together in a slightly hesitant manner, with drummer Max Franken unaware that the band has begun a new piece, and way down in the mix you can still hear a voice giving instructions - Newman's? Or maybe one of Rockfield's revenant presences? Elsewhere, human idiosyncrasies as well as ghosts in the machinery are left unedited, from a comically random and clichéd Ringo Starr drum fill at the end of "Today" to the curious momentary synth wobbles on "For the Place We're In" (played by Rockfield engineer Tim Lewis aka Thighpaulsandra). All of this puts the listener right in the room with the musicians. While the band members' musical freedom enhanced the live, organic sensibility, enabling them to explore ideas with each other in real time, it also contributed to the record's most striking quality: its diversity. Waiting for a Sign pushes further than Githead's previous records, underscoring the band's commitment to pursuing new directions. In fact, the music at times moves so far from the band's core identity that it's not obviously recognizable as Githead's work. The effect is mildly shocking in places, albeit in a paradoxical way: the band (as well as Newman, Spigel, and Rimbaud's solo enterprises) has always been fundamentally modern, allergic to trad musical motifs and overly familiar stylistic choices. So, when there are glimpses of familiarity or of nakedly traditional elements in Githead's sound-world, they come as a surprise. this album) and acoustic guitar. It's an unusually intimate moment for Githead - detailed, tactile playing, with the rasp of fingers and pick on the strings - before morphing into what Newman describes as "something like heavy country music." Most memorable is "For the Place We're In," whose melodic structure makes it Githead's first bona fide folk song, one that imbues the English pastoral with a distinct Eastern accent, thanks to Spigel's ethereal recorder part (performed in the studio's echo chamber). This may have been inspired, in part, by the rustic milieu of Rockfield: much as the studio itself was stimulating, the surrounding natural environment also made a strong impression. "In some ways, this is part of the mood that Rockfield gives," Newman says. "We were in the countryside and it was August Bank Holiday weekend. The courtyard was full of wheeling-and-diving swallows. Rockfield can be quite idyllic in that way." Beyond Rockfield, broader "life issues" may have also informed the songs, as some of Spigel's lyrics hint. Over the past few years, she and Newman have been plotting an escape from London (having lived there for over two decades) to England's south coast. "There are songs that talk about moving and changing, in a very positive way," Spigel says. "It was very hopeful, dreaming about different realities." Tracks like "Bringing the Sea to the City" and "To Somewhere," in particular, touch on the theme of relocation, establishing a dialectic between a sense of place, or rootedness, and a sense of movement, an interplay between the two contrasting ideas. If the possibilities of change offered by movement provide some subject matter, the transformative properties of the creative act itself also occupy thematic space on the album. This is again evident in Spigel's lyrics. They pick up the aesthetic questions addressed on her recent album Every Day Is Like the First Day, which concerned the notion of creativity as a daily blank slate, a constant process of starting from scratch. Here, "What If" and "Air Dancing" return to this idea, focusing on the ongoing dynamics of reinvention and starting-over that lie at the heart of the artistic endeavour. Ultimately, this is another way of framing Waiting for a Sign: Newman, Spigel, Rimbaud, and Franken approached the project as something of a blank slate, their minds free of predefined ideas and open to the creativity fostered by their encounter at Rockfield. Waiting for a Sign is their most accomplished release thus far. It's the work of a band that's unable to take the easy option and unwilling to repeat itself; it's a testament to their continued capacity for invention and their ability to surprise their listeners - and themselves.